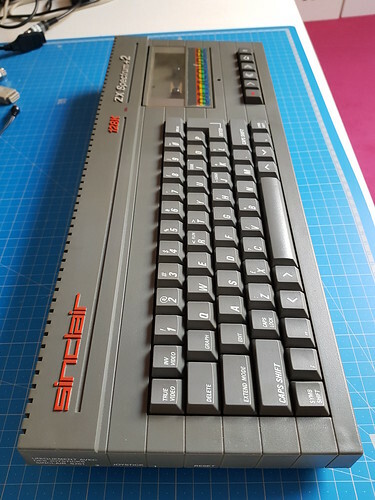 So I've got this ZX Spectrum 128k (grey). I've basically ordered a " grey " scart cable. But it doesn't work well (same kind of result on a CRT TV). 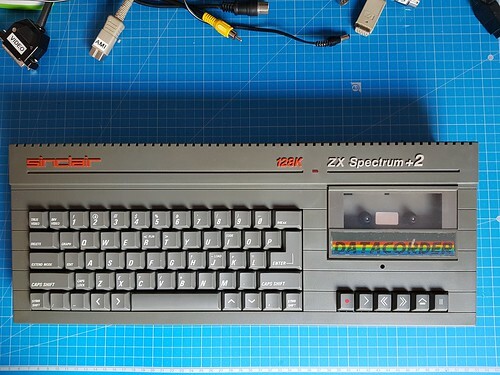 I've opened the beast and checked if everything was alright, then investigated the " LK " bridges and checked the existing documentations about ZX 128k " grey " and scart stuff. From then, I'm lost in my understanding.
" 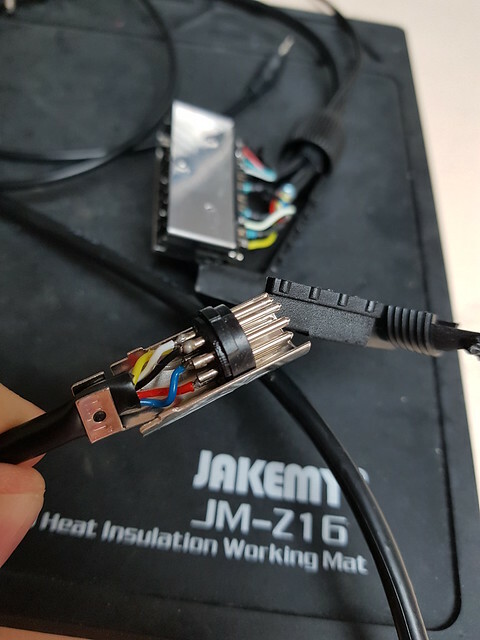 If link LK3 is closed instead of link LK1 then +12V is output on pin 5 of the monitor socket and can be used to drive the FUNCTION SWITCHING input of the SCART socket. If link LK8 is closed instead of link LK7 then the audio signal is output on pin 3 of the monitor socket and can be used instead of the SOUND socket. " Am I understanding that for this kind of " grey " I should use a " +2A/+3 " cable ? I have never had a +2 but I have had several +3s and on some TVs with a SCART cable they produce a perfect picture but on other TVs it is badly ghosted. Replacing R44 with a 680ohm resistor makes it work well on all TVs I have tried. Looking at your photos LK4 is not set and LK 2 is so maybe check R9? Amstrad configured the +2 machines differently depending on which country they were selling it in. Which SCART lead are you using? Can you post up details of the lead and the actual connections please. As there is more than one way to wire it up. 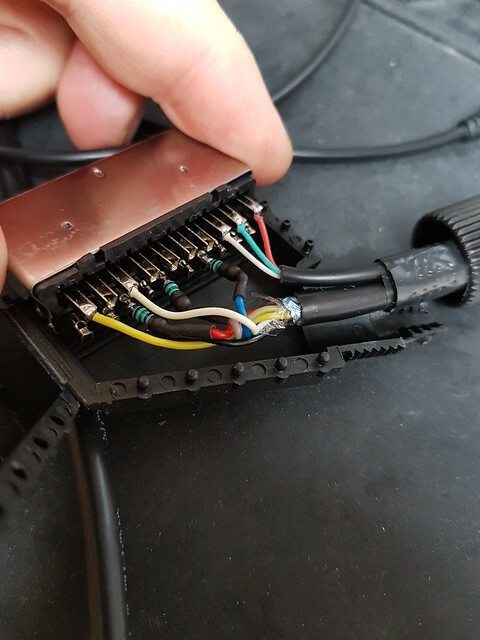 I myself, had to change one of the connections in a SCART lead I bought to make it work reliably with my +2 and my televisions. Also, some PCB versions have some of the transistors fitted the wrong way round. This affects some of the video circuitry. The problems are listed in a thread I started over at the World of Spectrum forums here. First, thanks for your help. I've decided to follow the LK3, LK2, and LK8 that are bridged on my motherboard to the DIN female port. So, from here ... What kind of wiring should I take from DIN to SCART ? Thanks And have a great weekend ! Found : it seems I simply have to use a " black +2/3 " cable. I'll build one, I have everything required. By the way, I have plenty of Ethernet Cat 5 cable, is it correct to use it for such a purpose ? 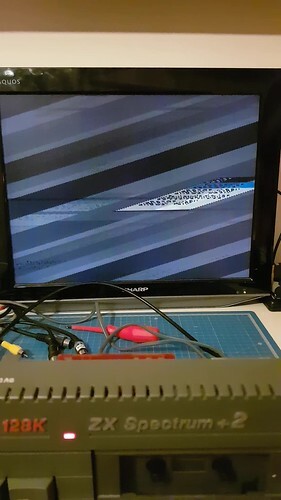 Second question : the Amiga world (1200 and more basically) is invaded by the " recapping fever ", I've recapped a ZX Spectrum 48k because it was required. 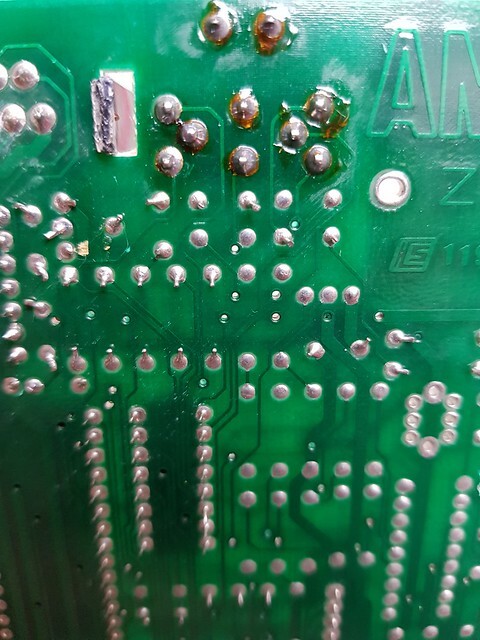 Are ZX 128 + in the same situation and have to be recapped ? I'm asking because in the Commodore world, C64s and Amiga 500 don't need that " systematic preventive " recapping. In all computer where caps are required to generate voltages its necessary to exchange the caps. They dry out and the voltages generated don't fit anymore. The RAMs requiring these voltages will break. Therfore yes. All spectrum computers require new caps. In a ZX81 the caps are only in nonimportant circuits. If a ZX81 need more tries to boot correctly the 1uF cap needs replacement. In theory, there is no difference between theory and practice. But, in practice, there is. I think some clarification is needed. 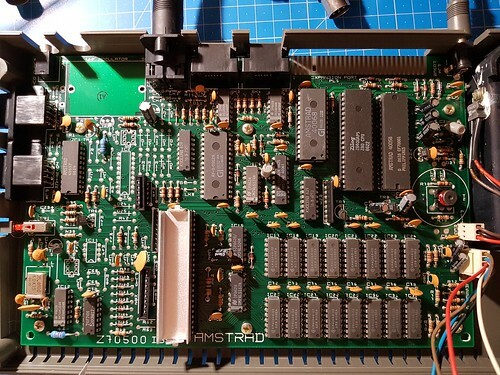 In a ZX80 or a ZX81, all the logic on the main/motherboard runs from the +5V rail. Unless the computer fails to work, there is no need to change any of the capacitors on the computers main / motherboard. And even then capacitor failure that results in a non-working machine is very rare. In a ZX Spectrum 16K, 48K or ZX Spectrum+, there is an on board DC/DC converter/inverter circuit. This converts the (nominal) +9V input to a +12V supply and a -5V. These are needed for the eight 16K bit 4116 (or equivalent) DRAM chips. As Paul says, these are not happy if some of the supply voltages are missing while others are present. So it is a recommendation to replace the electrolytic capacitors associated with the DC/DC converter/inverter. But as these computers run hot, especially the rubber key versions, while in there, you may as well replace all the electrolytic capacitors. With the ZX Spectrum 128 and the ZX Spectrum +2 (grey), there is still a DC/DC converter/inverter circuit, but none of the main logic chips/circuits are powered from it (only the serial port, aux/keypad port and some of the video circuits are powered from it). All the main logic chips/circuitry run from the +5V supply. So normally there is no need to replace the electrolytic capacitors unless there is a fault. However, in some machines (all of the above mentioned ZX Spectrum computers) if some of the electrolytic capacitors are near to / are life expired, it may affect the quality of the video picture. If this is the case, replacing the electrolytic capacitors may improve the quality of the video image. But this a bit subjective, as not all computers are equal due to different issue boards and slightly different parts being used during the many years of manufacturing. The later ZX Spectrum +2A, +2B, +3 and +3B models, these use an external PSU that provides a +12V and a +5V supply. So there is no DC/DC converter/inverter circuit. With these, normally there is no need to replace the electrolytic capacitors in the computer unless there is a fault. Hi Mark. 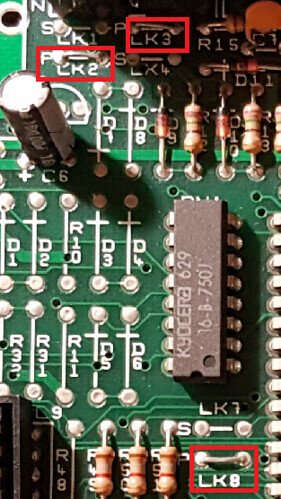 Any idea if the capacitors in a CPC 6128 need changing? I got one recently and it was working fine but tonight it has started doing weird stuff - a game (Sorcery+) that was running fine yesterday is now graphically glitching and crashing (memory fault?) and there are occasional interference lines going up the CTM 644 monitor - horizontal white lines that shoot up the screen from time to time. Turns out the USB stick in the gotek was dodgy! Must have bumped it at some point and the connector was lose. Replaced and all good. Still curious about the recap though. The CPC computer range runs on a single +5V supply. 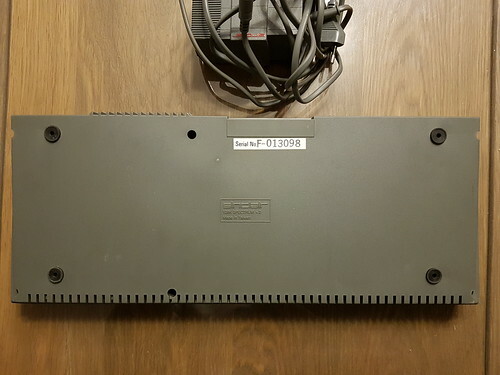 The +12V for the CPC664 and CPC6128 being required for the disk drive only. As such, no, normally there is no need to replace any electrolytic capacitors as preventive maintenance in these computers. The monitors may be a different story though.